There have always been good reasons to secure your apartment website design with an SSL certificate, which makes your website render on HTTPS pages rather than HTTP. For example, SSL (Secure Sockets Layer) makes it harder for hackers to invade your site. 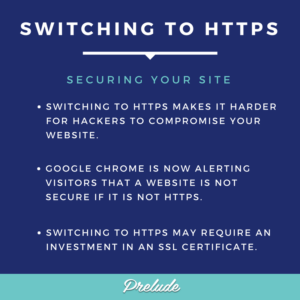 Starting in 2016, Google announced that HTTPS would be a component of its search engine algorithm, and sites with HTTPS would be preferred. But the biggest reason to change came in early 2017 when a new version of the Chrome web browser was released. With its release came a significant change in the way the browser displays websites that are not using HTTPS: It now puts a message in the location bar that says “not secure” on any pages that collect passwords. This change may confuse users and make them think your site is compromised causing them to back out or leave the site. Moving your site to SSL can be a hassle and it may require a small investment in an SSL certificate. However, it might be easier than you think. As an example, our hosting provider, Flywheel, provides it as part of their hosting plan. Either way now is the time to plan the move your multifamily website to SSL and ensure that your visitors aren’t leaving your site due to being alarmed by a new security message. If you have questions or need help, we’re here.